Is There Anything We Can Do to Reduce Radiation Risks? Doctors in Hawaii and the West Coast of North American are being bombarded with questions about how to protect ourselves from radiation from Fukushima. Initially, we should reduce our exposure to radiation in the first place. For example, world renowned physicist Michio Kaku told his Japanese family and friends months ago that they should leave if they can. Most residents of Hawaii and the Pacific coast of North American will – of course – stay. The entire population of the Northern Hemisphere can’t move down to the Southern Hemisphere, and most people aren’t inclined to move no matter what happens. But there are still many steps we can take to reduce exposure. If you live in an area receiving any radiation exposure, you should also take off your shoes and leave them by the door (Asian style) and use a Hepa vacuum to get rid of excess dust inside your house. 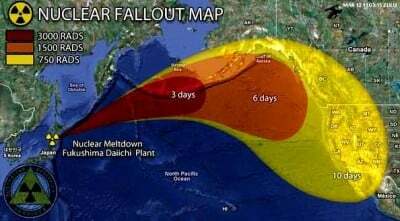 [In a worst case scenario, for example, if the fuel pool at Fukushima reactor 4 were to topple over], I would close my windows, turn the air conditioner on, replace the filters frequently, damp mop, put a HEPA filter in the house and try to avoid as much of the hot particles as possible. You are not going to walk out with a Geiger counter and be in a plume that is going to tell you the meter. The issue will be on the West Coast, hot particles. And the solution there is HEPA filters and avoiding them. Radiation also bioaccumulates in mushrooms. So it might be wise to consider avoiding mushrooms grown in Japan, Hawaii or on the Pacific Coast. In addition, rain is one of the primary ways that radiation is spread outside of the vicinity of the nuclear accident. As a parent who doesn’t want to tell my kids they can’t play in the rain, none of this is fun to talk about … but during periods of extremely high airborne radiation releases, people might want to keep their kids out of heavy rain. It is well-known that potassium iodide works to protect against damage from radioactive iodine bysaturating our body (the thyroid gland, specifically) with harmless iodine, so that our bodies are unable to absorb radioactive iodine from nuclear accidents. When taken at the appropriate dosage and within the correct time interval around exposure to radioactive iodine, KI [i.e. potassium iodide] saturates the thyroid gland with stable (non-radioactive) iodine. As a result, radioactive iodine will not be taken up and stored by the thyroid gland. Cesium-137 is light enough to be carried by the wind a substantial distance. And it is being carried by ocean currents towards the West Coast of North America. Fortunately – while little-known in the medical community – other harmless minerals can help “saturate” our bodies so as to minimize the uptake of other harmful types of radiation. One of the keys to a successful treatment outcome is to reduce or eliminate the uptake of internalized radionuclides before they can reach the critical organ. The terms “blocking” or “diluting” agent can, in most cases, be used interchangeably. These compounds reduce the uptake of a radionuclide by saturating binding sites with a stable, nonradioactive element, thereby diluting the deleterious effect of the radioisotope. For example, potassium iodide is the FDA-recommended treatment to prevent radioactive iodine from being sequestered in the thyroid…. Nonradioactivestrontium compounds may also be used to block the uptake of radioactive strontium. In addition, elements with chemical properties similar to the internalized radio-nuclide are often used as blocking agents. For example, calcium, and to a lesser extent phosphorus, can be used to block uptake of radioactive strontium. The first of a series of long-term field experiments was established on Bikini Island during the late 1980s to evaluate potential remediation techniques to reduce the uptake of cesium-137 into plants (Robison and Stone, 1998). Based on these experiments, the most effective and practical method for reducing the uptake of cesium-137 into food crop products was to treat agricultural areas with potassium fertilizer (KCl). Marine fish are usually about 100 times lower in cesium-137 than are freshwater fish because potassium, which is more abundant in seawater, blocks uptake of cesiumby marine organisms. Cesium is a close chemical analogue of potassium. Cesium has been shown to compete with potassium for transport through potassium channels and can also substitute for potassium in activation of the sodium pump and subsequent transport into the cell. (Richmond and Furchner 1961). After 20 days on the diets, rats receiving supplemental potassium had body burdens of 137 Cs that were one-half those of the rats not receiving supplemental potassium. This finding shows that supplemental potassium reduces the uptake and increases the elimination of ingested 137 Cs. Plutonium is treated like iron by our bodies. So getting enough iron will help reduce absorption of plutonium. And see this. You can buy calcium, potassium, iron supplements. You can also buy non-radioactive strontiumsupplements. Or incorporate foods high in calcium, potassium, and iron. A number of scientific studies conclude that Vitamin A helps to protect us from radiation. See this, thisand this. Numerous studies show that Vitamin C helps to protect the body against radiation. Radiological health expert Daniel Hayes, Ph.D., of the New York City Department of Health and Mental Hygiene suggests that a form of vitamin D could be one of our body’s main protections against damage from low levels of radiation. Writing in the International Journal of Low Radiation, Hayes explains that calcitriol, the active form of vitamin D, may protect us from background radiation and could be used as a safe protective agent before or after a low-level nuclear incident. “Vitamin D by its preventive/ameliorating actions should be given serious consideration as a protective agent against sublethal radiation injury, and in particular that induced by low-level radiation,” concludes Hayes. Vitamin E has also shown promise in protecting from low-level radiation, at least in animal studies.Here and here (the natural form may be healthier for you than the synthetic form). You can buy vitamin supplements, or eat foods rich in vitamins A, C, D and E.
During exposure to low-level doses (LLD) of ionizing radiation (IR), the most of harmful effects are produced indirectly, through radiolysis of water and formation of reactive oxygen species (ROS). The antioxidant enzymes – superoxide dismutase (SOD): manganese SOD (MnSOD) and copper-zinc SOD (CuZnSOD), as well as glutathione(GSH), are the most important intracellular antioxidants in the metabolism of ROS. Overproduction of ROS challenges antioxidant enzymes. Fresh fruits and vegetables are vital to include in your diet. And some – like blueberries – are quite high in antioxidants. But there are actually more concentrated sources of antioxidants which are inexpensive and easy to obtain. Glutathione – the “master antioxidant”, which is in every cell of your body, and which helps you utilize all the other antioxidants which you ingest – is probably the most important one to focus on. Here’s how to boost your glutathione levels. Finally, thinking about radiation may be stressful. But studies show that deep breathing, meditation, yoga, tai chi and other forms of relaxation boosts antioxidants and reduces free radicals. Some of the studies can be found here, here, here, here, here, here, here, here and here. Many other foods, herbs and supplements have shown some efficacy in helping to protect against radiation poisoning. This is not intended as a shopping list … there are just too many things to buy, and some combining some herbs with others may not be ideal. Rather, this is meant as a resource to keep handy, so that – if you have access to some of these items – you know what some of your options are. Curcurim (and see this) – the active ingredient in turmeric which, in turn, is in yellow curry (available in Indian and Thai dishes). And there is some evidence that brightly-colored produce may have some protective properties. Potassium iodide protects against damage from radioactive iodine, but should only be taken if one is directly exposed to high levels of radioactive iodine, and you should never exceed the recommended dosage. These are not candy, and can have their own side effects. So only take them – under guidance from your physician – if you are exposed to high levels of radiation. For a more complete discussion of commonly-accepted scientific consensus on different prevention and treatment options, please review the Army’s Medical Consequences of Radiological and Nuclear Weapons and the The American Association of Physicists In Medicine’s Medical Management of Radionuclide Internal Contamination. * As noted above, you should not take potassium iodide supplements unless you are exposed to high doses of radioactive iodine, because it can damage some people’s health. For chronic low-dose exposure, a daily, baseline level of mineral iodine is much healthier. Potassium iodide is found in most common table salt. However, levels are not uniform, and a lot of “iodized” salt has less than advertised. Here is a list of some iodine-rich foods. And see this. Disclaimer: The material contained in this essay is for general informational purposes only, and is not intended to diagnose or treat any condition. You should consult with your doctor or other qualified healthcare provider before making any decisions about whether or not to take any of the foods, herbs, supplements, substances or actions mentioned herein.